The stickers are so lovely, colourful and beautiful! They are totally 26 different perfume themed stickers, some of them are so large for getting our eyes to pay attention. And, the cutting of the stickers are so smooth. Great product! Anisia Nykoniuk is a Ukrainian-born artist, designer, photographer and fragrance blogger currently living in Vilnius. 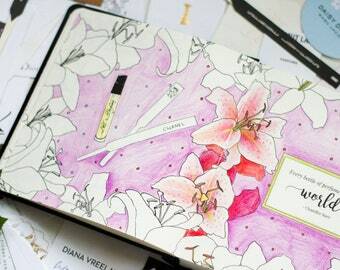 She also creates imagery for some of the most exquisite niche perfume houses. Learn more about her at anisiabeauty.com. Our beautiful diaries are printed in Balto Print Printing House in Vilnius, Lithuania.